5 Card Draw vs 5 Card Stud Poker - What is the difference? Not to be confused with each other, 5 Card Draw and 5 Card Stud are two uniquely different types of poker. While the two games share similarities, there are distinct variations which must be understood in order to recognise the rules of the game you’re playing. With names so similar, it can be easy to get the two confused so players need to be wary of the differences. So what are the differences between 5 Card Draw and 5 Card Stud? 5 Card Draw poker is the older and somewhat more popular game of the two and offers a good chance for bluffing, one of the strategies that significantly added to pokers fame. It is one of the most basic forms of poker available and the kind you’ll typically see in movies and TV shows. The game uses a standard 52 deck of cards and can be played with two to six players, with six players being ideal. To begin, each player places an agreed upon ante into the pot to enter the game. The ante is typically the equivalent of the minimum bet of the game. The dealer then deals five face down cards to each player, starting from the left of the dealer. Players look at their cards and the first betting round starts, with the player to the left of the dealer beginning the betting. 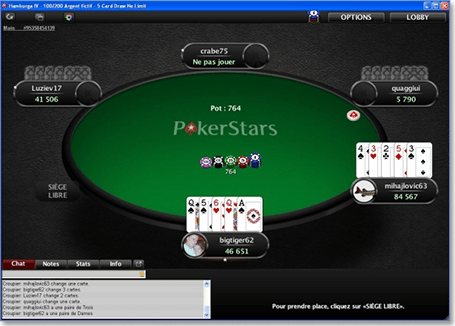 Each player has the option to call, raise or fold. Typically, each betting round is limited to four raises, but there are variations on this rule. If all players fold within the first betting round, the pot remains and each player adds another ante to start a new deal. The remaining players in the first betting round now have the choice to improve their hand by swapping cards. Players can discard and obtain up to three cards, or have the choice of keeping their original cards. Once all players have received their new hands, the second and final round of betting takes place. The player who started the first betting round also starts the second. During this betting round it’s a common rule that the minimum and maximum betting limitations are often doubled. This brings us to the showdown. All remaining players after the second betting round must reveal their cards, starting clockwise from the last player to call or raise. The player with the highest ranking five card hand is the winner and takes home the pot. If only one player remains they automatically become the winner. This is the sister game to the popular 7 Card Stud poker variant and follows a very similar game format. 5 Card Stud uses a standard 52 deck of cards and allows up to 10 players to play at once. Each player places an agreed upon ante into the pot to secure their place in the game. The deal begins with each player receiving one face up card and one face down card (the hole card). Betting begins with the player showing the highest value face up card, or if two players have cards of the same value, the player closest to the left of the dealer begins the betting. Each player has the option to call, raise or fold. If a player raises and all succeeding players call or fold but don’t raise, no further raise may be made until the next betting round. Each player is then dealt a third face up card and a second round of betting takes place, with the player to the left of the dealer starting the betting round. This continues for a fourth face up card and a third betting round, then a fifth face up card and a fourth betting round. During these subsequent betting rounds, if each player checks, play proceeds directly to the next betting round. If a player raises, following players only have the choice to raise, call or fold. The remaining players then enter the showdown to reveal their final hand. If only one player remains they don’t have to reveal their hole card, which is where bluffing skills come into play. The player with the highest ranking five card hand wins. The winner of the game takes the entire pot. After reading the rules of the two games, you can see that five card stud and five card draw are indeed quite different. The most significant difference is that whereas in 5 Card Draw players start out with a complete hand of five cards, in 5 Card Stud players only start with two cards, and work their way up to a five card hand if they manage to stay in the game. In 5 Card Draw players also have the option to exchange less desirable cards for the chance of a better hand, while in 5 Card Stud players must make do with the cards that they are dealt. The version of poker you choose to play comes down to personal preference and neither five card variation is technically “better” than the other. 5 Card Draw is one of the most basic forms of poker and is a good starting point for beginners. Our recommended online poker websites offer both versions, so you can try your luck at either in free play mode in order to choose which five card poker variant you like best. Once you’ve familiarised yourself with the games you have the choice to move on to play for real money wagers using a range of secure deposit and withdrawal methods. Our favourite poker sites include 888 Poker, PokerStars and Full Tilt Poker. These poker venues both require a quick software download, which is free and only takes a couple of minutes, opening the door to a huge range of poker games including 5 Card Draw and 5 Star Stud.